How do I stick my brush in painting birds? I got captured by the birds. That's how. It's a painter story. I must admit I had never planned to be painting birds. By chance, I live in the area that has been developing conservation for birds. The birds came to me and I fell for them. I practically live with birds everyday. Years a go, I was given a book, a very old book of Eric Ennion, the master and founder of bird conservation in England. With the book and the birds, paper, colors and a brush in my hand I capture them. I got hooked, just like that. Then I started to play with them. 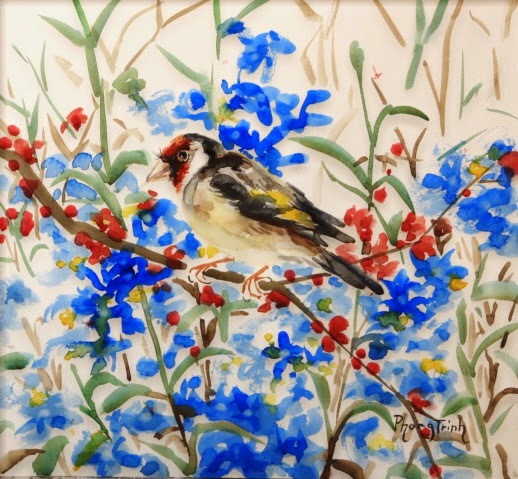 Every summer, I had a lot of fun with the goldfinch. They came to the garden to have a feed on flowers seeds. It was joy to watch them... I notice every time I paint a bird I feel happy.. like a bird!